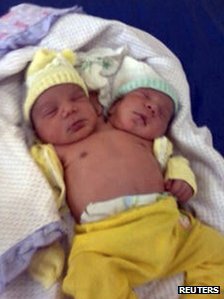 "Conjoined twins have been born in Brazil with two heads, two functioning brains and two backbones - but a single heart. The rare condition is thought to have occurred when one of the pair failed to fully develop in the womb. Doctors say separating the twins, named Jesus and Emanuel, is not currently an option because there is only one set of organs, Reuters reports. They are being monitored by specialists to see how they develop. Dr Neila Dahas, who is treating the newborns, said surgery was not being considered at the moment. But she said separating the boys would be impossible because of the single set of organs - and that it was difficult to choose which head to remove because both brains were functioning well. "What we know statistically is that the children who undergo surgery and survive are the children who have less organs in common," she added. "What we've got to think about at this moment is to maintain the children in good condition and see how they will develop." 'No scans' The condition, known as dicephalic parapagus, is rare. However there have been other known cases, notably Abigail and Brittany Hensel who were born in the US in 1990. They aim to live as normal a life as possible, even taking their driving test when they were 16.